This history commences at the start of the association and gives for the first time an idea of what the organisation did since 1856. Group formed in October 2000 has now set up and is building a resource on Thurso at the library. There are several old photographs of Staxigoe in the Staxigoe Pages in the A to Z section. This centenary booklet was produced to celebrate the first 100 years of the church in Wick. The story of Harrow pavement works has its origins in 1853, during the time of Alexander the 13th Earl of Caithness, and owner of the Mey Estate. Viking Centre - information not yet available. Take a short walk round the Flagstone Trail. There are a huge number of prehistoric sites in Caithness. Little has been done to investigate most of them. The listing here gives only a small number of the easily accessible sites. There are about 100 known Brochs and many standing stones, rows and circles. Other sites are being discovered regularly by keen local historians and walkers. Caithness Field Club who are happy to welcome visitors. All the parishes in Scotland including Caithness are available for the 1791 - 99 and 1845 accounts. A small section ready to receive more information at a later date. Check the site for others. MISCELLANEOUS CITY NEWS; THE EARL OF CAITHNESS. Well worth a few visits for Caithness and many other Highland places. The site is in Gaelic and English. A fantastic resource for history and general interest with a rapidly expanding number of pages and photographs and links to other sites. An exciting heritage project that was established in October 2006 to investigate and document abandoned rural settlements throughout Scotland is about to launch a Teachers’ Resource Pack for use by teachers and pupils throughout Scotland in the Curriculum for Excellence. Scotland’s Rural Past is a project that supports local communities to investigate the remains of long abandoned settlements in their area that often date back hundreds of years. The project encourages members of the public to discover more about historic rural settlements, by learning valuable new techniques and skills in archaeological identification, surveying and recording, to rediscover a sense of place and gain a greater understanding of the changing historic landscape around them. The Teachers’ Resource Pack has been developed after a series of close consultations and training courses with volunteer groups, Young Archaeologists Clubs and schools around the country. The pack comprises case studies designed to present teachers with the types of evidence – aerial photographs, old maps, archaeological plans and records, and historical documents – that will enable schools to become actively involved in the exploration of Scotland’s rural past within the Curriculum for Excellence framework. 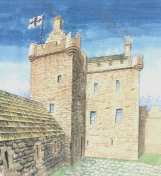 Scotland’s Rural Past works closely with experienced staff from the Royal Commission on the Ancient and Historical Monuments Scotland (RCAHMS) to provide training for volunteers in archaeological field techniques and documentary research. It also offers support to develop educational projects to raise awareness of and improve access to Scotland’s rural history. The project has received tremendous support from enthusiastic members of the public and over two hundred volunteers are currently registered. Over the past year, highly successful field trips and workshops have been held in Killin, Bute, Lanarkshire, Braemar, Glen Clova, Mull, Islay, Edinburgh, Inverness, Wigtownshire, Moidart and East Lothian. Over 100 volunteers have now received professional training and 19 local projects are so far underway around Scotland with volunteers researching and recording their local rural heritage. The project has also recently launched an interactive website to enable volunteers to share their ideas and research. Dr Tertia Barnett, project manager for Scotland’s Rural Past said: ‘We are delighted that this important project has been such a success over the past year – communities have worked together to learn new skills and to engage with their environments. We’re now very proud to be launching a resource that has already been lauded by the education sector. A significant contribution has also already been made to Scotland’s recorded heritage and we now feel that this resource will make a significant contribution to its greatest natural resource – its people. The Sea - a project from Hillhead school with pictures gathered from the family albums and made into an exhibition. Caithness.org has a few of the pictures if you cannot make it to Wick to see the exhibition. It has won an award from the History Channel. After the exhibition we hope to be able to bring you more of the pictures which show in part the story of the sea in Caithness in the last few generations. The exhibition runs until 24 March 2001 in St Fergus Gallery, Wick.